One of my all time favorite films is "The Petrified Forest" with Humphrey Bogart and Leslie Howard. The scenes in which Leslie Howard trades his views on life, and love, with Bette Davis are the meat of the film. For years I have watched this movie time and again, always awed by the scene in which Bette Davis reads Francois Villon's "Ballad for a Bridegroom." It's a beautiful poem, one that speaks of true love and the protections and responsibilities that come with it. It is, I believe, one of the most beautiful sentiments ever put to pen. 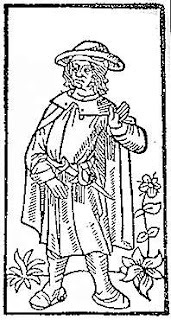 This woodcarving is one of Villon done in the mid 15th century, upon the publication of one his books of poetry. Here is the translation from the French by the English poet and author Algernon Charles Swinburne.